Fort Getty is one of several former military forts that guarded the entrance of Narragansett Bay. Today there are only a few remnants of the fort and the site is used mostly as a campground in the summer months. As a matter of fact, you will not be able to access the site without paying a fee during camping season here. So spring and fall (or in the case today, late winter) are the best times to visit. There are two trails, one on each side, that hug the perimeter of the peninsula. I started this walk from the pavilion just after the entrance. I then followed the road for a bit before bearing right onto a trail named after Kit Wright. This trail winds through a shrubby area for a bit. 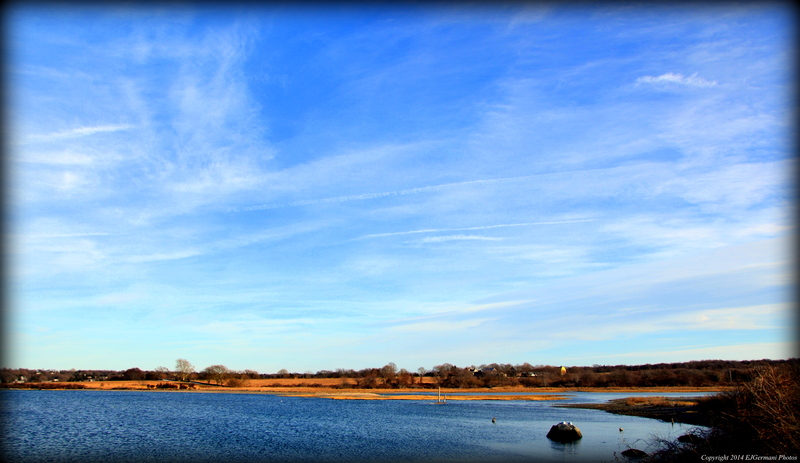 There is an overlook here that has a view of Fox Hill Salt Marsh. The trail then ends back out to the road. From here I turned right and followed the road to its end and onto the dock. There is quite a bit to see from here including the Jamestown Bridge, most of Jamestown south of the bridge, and the Dutch Island Lighthouse. I then retraced my steps back a bit before turning right and onto the second trail that follows the perimeter of the park. There are several places to view Narragansett Bay along this trail. The trail eventually ends at an open grass area. I continued following the edge of park (the trail is quite faint here) and it led back to the pavilion. I then drove down the street to Beavertail for some much needed solitude.